At Wire and Cable India in Mumbai, Huber | Martinswerk partnered with distributor Sharda Enterprises in hosting a successful stand allowing us to meet with many current and prospective customers to discuss our Halogen-Free Fire Retardant Additives. 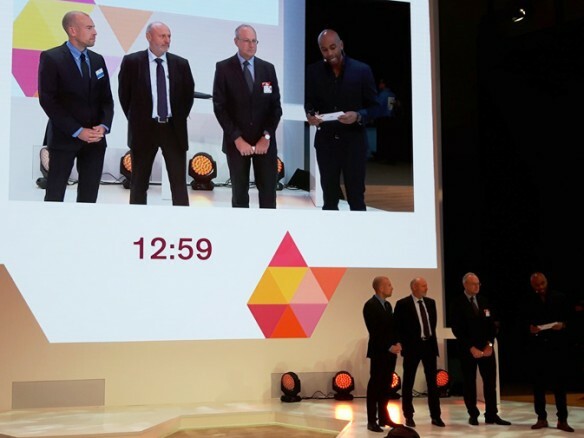 Pictured during the event are (from left) Umesh Viyas and Mani Iver, both with Sharda Enterprises; Annegreth Zoor and Mario Neuenhaus, both with Huber | Martinswerk; and Sharad Viyas with Sharda Enterprises. One of the pleasures we so enjoy is being able to visit with attendees from around the world at various conferences and trade show events. Such was the case earlier this month as we traveled to India, an emerging country with one of the most dynamic economies currently driving global growth. 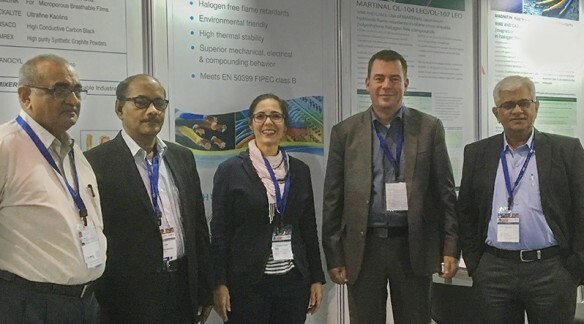 In Mumbai, we partnered with distributor Sharda Enterprises at Wire and Cable India, giving us the opportunity to visit with current and prospective customers to discuss our Halogen-Free Fire Retardants and Smoke Suppressants. Another highlight of the event occurred when our Huber | Martinswerk technical team partnered with a key customer to give a well-received presentation on cross linked wire and cable compounds. There were a number of good and interesting questions fielded and answered during Wire and Cable India about our Martinal® Aluminum Hydroxides and Magnifin® Magnesium Hydroxides. We appreciate the interest we received in our products during Wire and Cable India and invite you to Contact Us for more information on our Halogen-Free Fire Retardant Additives. Huber | Martinswerk Joins Specialty Ingredient Suppliers in Delivering Key Joint Presentation at K 2016 Trade Fair! Huber | Martinswerk partnered with Dow Elastomers and Fraunhofer LBF in delivering a key technical presentation titled “Extinguishing Fire Hazards” at K 2016. On stage for the presentation as the panel moderator (right) makes introductions are (from left) Martijn Mies of Huber | Martinswerk; Manfred Döring of Fraunhofergesellschaft LBF; and Stefan Ultsch of Dow Europe GmbH. Huber | Martinswerk continues to welcome and greet customers at K 2016 in Dϋsseldorf, Germany. It has been a very successful event thus far for our team and we’re pleased we’ve had the opportunity to discuss our high performing Halogen-Free Fire Retardants and Smoke Suppressants with so many attendees. The week-long trade fair opened Oct. 19 and runs through Wednesday of this week, Oct. 26. This past Thursday (Oct. 20), Huber | Martinswerk had the distinct pleasure in partnering with Dow Elastomers and Fraunhofer LBF to jointly present a state of the art update and latest concepts in halogen-free polyolefin formulations. The presentation was titled “Extinguishing Fire Hazards, Addressing the Most Demanding Fire Regulations with New Formulation Concepts.” Among the many topics covered, the presentation team addressed Euroclass B, EN 45545, fire retardance environmental friendliness and smoke toxicity. Last week’s presentation was another example of the cooperation among specialty ingredient suppliers as Huber | Martinswerk has been working jointly with Dow Elastomers for many years. Huber | Martinswerk has a dedicated technical team with a great deal of analytical expertise along with comprehensive fire testing capabilities to develop innovative products and solutions that meet the exacting performance requirements for a variety of applications. As K 2016 enters its last couple of days, we cordially invite you to visit with us in Hall 6, Stand D61 in Dϋsseldorf. 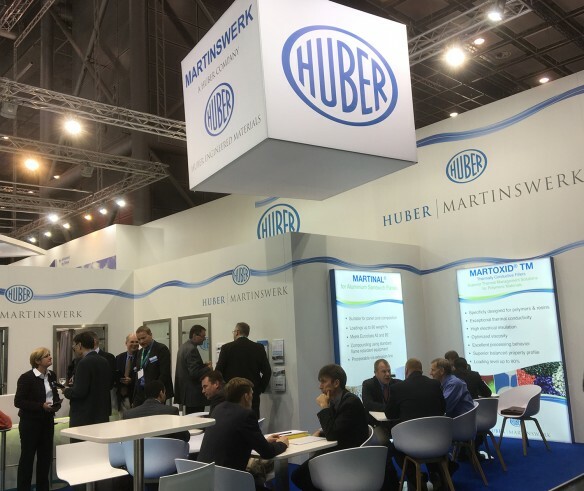 Busy Booth Activity as Huber | Martinswerk is Off to Strong Start Exhibiting at K 2016! Huber | Martinswerk booth full of activity as the K 2016 trade fair begins in Dϋsseldorf, Germany. This week and through October 26, the Huber | Martinswerk team is excited to be in Dϋsseldorf, Germany exhibiting at K 2016. Billed as the #1 trade fair event in the world for the Plastics and Rubber industries, there’s little doubt we’ll stay busy over the next several days greeting customers, prospective customers, distributors and friends. Our team is already immensely enjoying the event as our booth has been bustling with activity since K 2016 opened. We cordially invite you to stop by Hall 6, Stand D61 to learn more about our Halogen-Free Flame Retardants and Smoke Suppressants for Plastics and Rubber related applications, including Wire and Cable. Several specific Huber | Martinswerk brands we are featuring are Martinal® Aluminum Hydroxides, Magnifin® Magnesium Hydroxides and our new Martoxid® TM Thermally Conductive Fillers. Read the press release by clicking here we distributed before the event to learn more. If you’re in Dϋsseldorf for K 2016, we look forward to seeing you soon! An Outstanding and Busy Fall Trade Show Season for HEM! 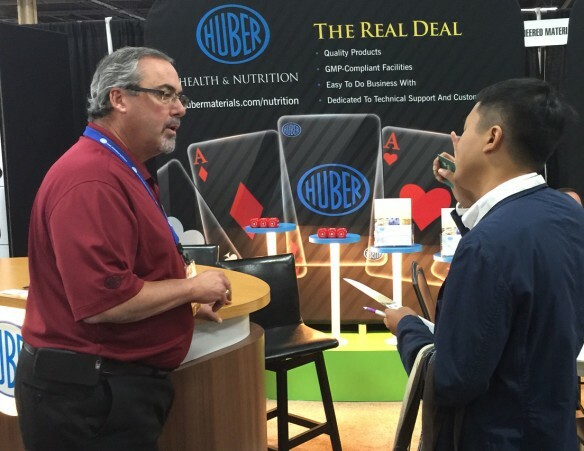 Huber’s John Garcia (left) discusses the benefits of HuberCal Pure and Natural Calcium Carbonate with an attendee of SupplySide West in Las Vegas, Nevada. Huber Engineered Materials exhibiting at the International Wire and Connectivity Symposium (IWCS) in Providence, Rhode Island. The fall has been a very busy season thus far for Huber Engineered Materials as we’ve had the opportunity to hit the road for a series of trade show events which has given us the opportunity to meet in person with our valued customers, prospective customers, distributors and friends. We’ve enjoyed success and stops in the U.S. at SPE Vinyltec in Iselin, New Jersey; The Composites and Advanced Materials Expo (CAMX) in Anaheim, California; International Wire and Connectivity Symposium (IWCS) in Providence, Rhode Island; and SupplySide West in Las Vegas, Nevada. This week, we are in Pittsburgh, Pennsylvania in booth #740 exhibiting at the International Rubber Expo at the David L. Lawrence Convention Center showcasing our Halogen-Free Fire Retardant Additives and Precipitated Silicas and Silicates for a variety of rubber-based applications. 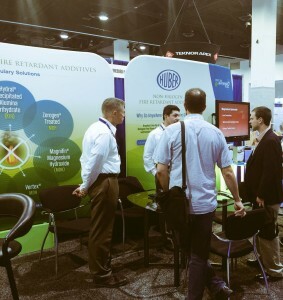 We invite you to stop by and visit with us as we share how our specialty ingredients can work in your most demanding formulations. After International Rubber, it’s on to K 2016 in Dϋsseldorf, Germany as we again tout our wide variety of Halogen-Free Fire Retardant Additives. We look forward to seeing you at K 2016 Oct. 19-26 in Hall 6, Stand D61.